Sita was watching the entrance door, for she was anxious to learn what had happened at the palace of Kaikeyi, and why Rama had not come as yet, though the auspicious hour fixed for the Coronation was fast approaching. She had finished her own rites of Vigil and Fast, and held in readiness a plate of sandal paste, flowers, grain and other prescribed articles so that there would be no delay caused by her tardiness, to accompany her Lord to the Coronation Hall. Her heart was beating fast in expectancy of Rama's arrival. All the maids and attendants around her were overcome with the ecstasy of the coming hour of triumph. Lovely maidens were ready with sparkling lamps for the ceremony of waving them before Rama as he entered. Into the decorated hall shining in unprecedented charm, suddenly Rama stepped in, unheralded, with bowed head, and on bare feet. Every one was shocked. Sita moved forward towards her Lord; she could scarce believe her eyes. Her body shivered like a leaf in the wind. She bit her lips and swallowed her surprise. "Lord! What is the meaning of all this; Why are you thus? You said this day is the day dedicated to Brihaspathi, the Preceptor of the Gods; you said, it is a very auspicious day, the star is Pushya, and you are to be crowned this day as the Yuvaraja, the Crown prince, of this Empire. How is it that they do not hold over your divinely beauteous self the White Umbrella of Imperium with the brilliance of sunlit Pearls, with its hundred ribs of gemset gold? Where are the resplendent whisks with their featherpure sheen that appear like Moons? Why are they not accompanying you today? Why are the minstrels of the court silent, without singing your praise, as you proceed to the Durbar Hall? O, Lord! How is it that the Masters of Vedic Lore, the Brahmins have not anointed you with consecrated honey and curds? And, the Ministers, the Vassal Kings, and the Leaders of the various communities in the State are not walking behind you, as usage requires! The majestic royal elephant, a mountain peak on the move, Sathrunjaya, tramping the ground, making people mistake it for a dark blue cloud flowing over the road, he must come first, announcing your arrival, shouldnít he?" While Sita was raining questions like these, Rama could not decide how to answer them; it was not a matter that could be explained quickly in few words; so, Rama entered an inner Hall, and drawing Sita nearer, he said, "Sita! Revered Father has willed and resolved at this very auspicious hour to send me to the forest; therefore, it has become urgent to honour his command". Sita heard the words, but she could not believe that they could be true. She asked, "Lord! What crime did you commit to deserve this punishment, this exile into the forest? Dasaratha is the embodiment of justice, a dharmatmaa. He will never issue an order of this nature without legitimate reasons! What is the real purpose, the inner significance, of this order to live in the forest?" Rama smiled at her question, and replied, "Sita! Long ago, father had promised to grant mother Kaikeyi two boons; but, that promise had not been fulfilled so far; she too had not demanded them, until now. This day, she asked for them both. They were, first: Bharatha must be crowned as Yuvaraja, and second: I should move into the forest, and live there with matted hair and vestments of bark for fourteen years. Father is supremely righteous. He never acts against the plighted word. Therefore, he bowed his head to Dharma and acceded. I felt I should see you before leaving! You have taken birth in a greatly revered family. You know and value all the moral codes and goals. Janaka Maharaja, Master of the inner Mysteries of the highest morality, is your father. You too walk steadily on the path of Dharma. I have to leave for the forest this very day. Dasaratha has given this empire, inherited by him through many generations, to Bharatha; from now on, he is the Lord over this realm. Immediately after being crowned, he will come to you for your blessing. Do not extol me before my brother; nor should you exhibit any trace of sorrow or displeasure at my being sent to the forest. Donít slight him or look down upon him. Kings appreciate only those who adore them and serve them. So, do not praise me or decry him. He is my brother and your brother-in-law; but, that is only with reference to physical kinship; with reference to kinship, Bharatha is your monarch and mine. Give him due honour. Do not cause any displeasure or distress to him by word or deed. Fair one! Follow the directives of not only Bharatha, but, also of old father, Dasaratha. Serve also mother Kausalya who is suffering unspeakable agony because I am leaving her. Take all appropriate measures to keep grief away from her. The other two mothers, Kaikeyi and Sumitra, them too, you must obey and please. Sita! Bharatha and Sathrughna are to me as dear and close as my very breath. Treat them as your own brothers; or, foster them lovingly as your sons. 0, charming damsel! Do not leave this place and go to Mithila City, for the reason I am not here. Remain in Ayodhya itself, and, comfort mother and father, serving them in suitable ways to remove the sorrow from their hearts. With love and care, confer comfort, courage and contentment on them." When Rama was instructing Sita on her duties, she could not contain her laughter! She also felt sense of shame at the turn the arguments took. She could not remain silent for long. "Rama", she interrupted, "Rama! you are the son of Dasaratha. I have not heard at any time words unworthy of that lineage fall from your lips. Mother, father, brother, sister, son, daughter-in-law every one has to experience a quantum of happiness and misery; in proportion to the good and bad done by each. But, the wife has a special source of fortune, good or bad. That is to say, she has a share in the good and bad for which her husband is responsible. She is endowed with a part of his joy or grief. So, if the Emperor Dasaratha has ordered you to go into the forest, he has given me too the order to go. A woman may be fed and fostered by her mother and father; she may be revered by her son; she may be served by her maids. But, they can never be her shield and support. The trinkets and toys with which you try to convince me serve only to arouse amusement in me. During the years preceding my wedding, father taught me all the duties that shall guide and bind me. I am neither an ignoramus nor a seeker of power. And, more than these, let me tell you, I do not cling fanatically to any opinion because it is mine. There is no need for you to point out my special duty to me, for, I know them all. It is only when I decide to remain here, isn't it, that you have to tell me how and in what ways I have to serve the parents-in-law, the sisters-in-law, and the ruler of the land? But, when I am with you, what chance is there, what need is there, for me to take on the service of others. I am coming with you in full joy! Since a long time, I have had an unfulfilled desire to spend some years in forests. It is my good fortune that I have now the chance to satisfy that desire, in the company of my Lord! I will not give ear, if you insist that I should not express my point of view in this great matter. Donít be angry with me that I disobey you. It is not just and proper for you to throw me aside here, as one throws out water from the cup after quaffing a mouthful. Believe my word! I shall not continue in Ayodhya even for a moment; take me with you". With these words, Sita fell at Rama's feet and held them tight. "I have not the slightest sorrow that you were not crowned. I hold you dear, crowned or uncrowned. Wherever you are, that is the Empire for me. There is my Treasure. That is my Glory," she pleaded and prayed. Rama told her that forest life was fraught with fears and dangers. The forest was infested with wild animals and wilder men, demonic depredators and dacoits. One has to encounter floods in rivers, wade through thick thorny undergrowth. He said that she was not used to traverse places on foot and therefore, she will have to undergo great exhaustion. He described various other forms of fear and anxiety that will confront her. But, Sita was unmoved. She replied. "Lord! However wild the animals may be, however thick and terror-striking the forest may be, what harm can they cause, what injury can they inflict on me, when you are by my side? I can walk through forest tracks; it will be no trouble for me. I will be happier if you ask me to walk first, preparing the path smooth for you to tread. I shall pick and cast away stones, pebbles and thorns to lessen pain, making your journey easy. Allow me to be with you, so that I may render this service and be happy. Here, in the palace of Ayodhya, and in the zenana, I could not get the chance to serve you. I felt worried and miserable that all services for you were undertaken by attendants and aides. There will be no attendant, no aide in the forest! So, I can be happy, doing all the services myself. That is my great good fortune! Make my life worth while, Lord. Give me that glorious chance!" Sita prayed in a variety of ways, pleading for mercy and justice. Rama was moved to compassion, He said, "Sita! Living in the forest, you cannot be happy, you have to suffer greatly in the coming days". Rama expatiated on the horrors of jungles and the sufferings that one has inevitably to meet there. But, Sita stood firm. "Rama, I shall not interpose any obstacle in the observance of your vows. From your words, I infer that you are hiding something from me, some objection which you do not like to raise before me. I shall observe along with you the vows of personal austerity incumbent on a person on the Brahmachari path; I too shall live on tubers and fruits. I too shall discard the use of scents; we shall only inhale the fragrance of forest flowers. You are a scion of the lkshvaku line, which has saved millions from danger and disaster! Can you not guard me against them? Are you so weak of hand? I wonít give you trouble; through me, you will not have the slightest worry. Lord! I cannot but follow you. I will lay myself down and sleep at your feet; that will give me the fullest bliss. Rama! I know and recognize none except you. I cannot exist alive for a moment apart from you. Well. If you hold fast to your resolution and proceed, leaving me in Ayodhya, Sita would have drawn her last breath before you reach the forest. Take this as Truth". Sita's eyes shed streams of tears as she spoke these words. Rama tried to pacify her. He said, "0 "Sita, you are a very staunch adherent of Dharma. It is best for you to stick to your righteous qualities maintaining them at this place. You cannot act as your will dictates; you have no freedom to behave as you desire. Your Dharma is to act in accordance with my words. Therefore, give up this idea of yours. I am saying this for your own good. Guarding you will be a burden for me certainly. Streams rolling down from mountain peaks, wild beasts that dwell in the caves, lions and tigers roaming without let or hindrance amidst the hills and valleys - these have to be overcome. Rivers in spate will have to be forded. We may have to leap down from huge boulders and rocks. Considering these difficulties I have to tell you in such emphatic terms to stay. You have to wear matted hair and clothes of the bark of trees. We men have to go to some river or lake for the evening rites of worship; at that time, who will watch over you against any calamity that might happen? Whatever may be the crisis, we cannot give up those rites. You know how strict that rule is; so, you may have to be alone for some time daily. We cannot say what will happen when". Rama tried to picture before Sita fearful scenes of forest life, but Sita was not affected in the least. She said, "Rama! Why tell me these things, as if I am a simpleton of some back-ward village; or an ignorant stupid woman, unaware of the teachings of the Sastras? I am well aware of your skill and prowess. Nothing is impossible for you on earth, nay! in all the fourteen worlds! And, when you are with me, what fear can disturb me? Well, if a wild beast attacks me and I fall a prey to it, I will be happy that I die in your presence, rather than anywhere far! I shall die happily then. I shall never agree to a life, if I have to spend it without you. You said that I have no freedom to do as I wish. Did you say so, with the full consciousness of its meaning? Or, was it just a remark to test me? I am not able to reason out. I am half of you; it is my right to name myself as your half. You too have the same right. And, that is the truth. You are not fully free, nor am I. I have as much right over you, as you have over me. But, I do not now plead for my rights or claims. I am yearning for being near you, being ever in your presence. My words arise from that craving". Listening to Sita revealing her hard determination, Rama continued. "Sita! You are entangling yourself in the complexities of rights and claims! When I proceed to the forest, the aged parents will be wailing and weeping for me. At that time, you can console and comfort them, with gentle assurances. That is your duty. You must conduct yourself according to the needs of each occasion. Be with them; serve them; that is the way to please me, and give me Ananda". Rama spoke as if his decision was final, and in a tone of command. But, Sita responded only with a smile. "When the son born of these very parents plunges them in deep grief and goes away, clinging with a bearís grasp to his adamantine resolution and, when the very son whom they love so much gives everything up and goes into the forest, what responsibility has the daughter-in-law, who has entered this house-hold from her own, a stranger in the family, what responsibility has she to console and comfort those deserted by the son? Ponder over this for a while!" she said. "I am told you insisted on your mother remaining here, serving her husband, though she wept out her eyes in bitter tears, and prayed that she be allowed to follow you to the forest! You told her that her duty of serving her husband is predominant. You declared that it will bring untold disgrace on the Ikshvaku dynasty if she abandons the lord she is wedded to, out of affection for the son she has borne and brought forth into the world! Such moral rules of inestimable value, you dilated upon, before her. But, as soon as you come near me, you have reversed that advice and started telling me that my predominant duty is service to the parents-in-law and not service to the husband! Think it over! Which is the correct advice? For the wife, the husband is God - this was not laid down for Kausalya alone; it is the guide and goal for women, all over the world, without exception. You have, evidently, forgotten this truth, for it does not suit your present wish. You are unable to explain how the moral rule you quoted before Kausalya does not apply to me. "However long you argue, whatever you may assert, I shall not leave off treading along the prints your feet make. You may kill me for transgressing your order, but I assert I can never be without you. Ramachandra! No sooner did you speak of the exile in the forest you are entering upon than I had such an upsurge of joy, remembering an incident that took place in my childhood! You cannot understand the extent of that joy! My mother, with me seated on her lap, was immersed in anxiety about the husband destiny had in store for me, whether he would be morally upright and endowed with excellent attributes. She was stroking my hair, and lost in thought. The maid put in her appearance just then and announced that certain woman ascetic desired audience with her. She lifted me and gently placed me on the floor, and went forward to meet her. Mother fell at her feet and directed me to do likewise. I did as she directed. The woman eyed me closely from head to foot, and said, 'Mother! Your child will spend years with her husband in the forest! At this, my mother replied, with a laugh. 'Not married yet! And, you talk of her spending life in the forest!' She did not keep quiet, however. She explained, 'After marriage! She will have to live in the forest with her husband, for some time!' And then, she went her way! Ever since that day, I am looking forward excitedly to the time when I can go and live in the forest with my Lord! Make me happy, take me with you". Sita fell at his feet and sobbed out her prayer. Rama was moved to pity. He raised her gently and said. "Sita! To whom else am I to confide the secret spring of my decision? Listen! You are young; in the forest there are many hermitages full of ascetics, hermits and sages. I will have to go to them in order to be of service to them and to offer my reverence to them. Kings and Princes too may be present there (since they come to hunt) and honour them and be blessed by them. Their eye may fall on you; and, consequential complications and conflicts may arise. And, since I will be wearing the apparel of an ascetic, it may not be proper to enter into fights with them. At least for this reason you will have to remain in Ayodhya." Sita had her own reasons to protest at this. She said, "Rama! It is not just that you should deceive me, spinning such fairy tales, as if you are of common stock! When you are by my side, can even the Ruler of the Gods cast his eye on me? If he does, will he not be reduced to ashes that very moment? No, for this reason, you cannot leave me here; you cannot escape your duty and responsibility on this score! Let me also tell you something: If you are not with me, what will be my fate? I will have to be alone, in Ayodhya; and incidents of the nature you just now dilated upon can happen here! Or else, I may suffer inner agony not being able to bear the conjugal happiness of others! So, do not leave me alone, take me with you, and let your renown and mine spread for all time over the entire world. Let me add: You are dear to all as Ramachandra, Rama the Moon! I am Sita, which means, cool, the cool Moonlight! How can the moon be in the forest and its cool light stay away in Ayodhya? Where the moon is, there its light must be! Hence, this separation can never be. The two shall ever be together, never apart! If the two happen to part, it is but evidence of the approach of some unnatural catastrophe, a world shaking tragedy. Or, it may come about for the sake of an epoch making endeavour to destroy the wicked and save the good from extinction! Since no such crisis is evident now, our separation is impossible. It cannot happen". Sita, the Supreme Mother, spoke these words in a resolute voice, as If she would brook no objection. "Sita! You will have to sleep on hard rocky ground, wear apparel made of fiber or bark, live on tubers and roots. Even this food, it might be difficult to get every day! Their availability depends on the seasons of the year. When they are not procurable, you might have to be hungry for days. The forest is infested with demonic tribes who are masters of a million stratagems, and who eat with delight human flesh. O! it is impossible to describe fully the travails of life in the forest! You cannot bear these terrors and tribulations. If you accompany me into exile, people will condemn me and pour abuse on me. How can the Celestial Swan that lives on the ambrosial waters of the Manasa-Sarovar survive drinking the brackish waters of the sea? How can the Kokil sporting in the garden that is full of tender-leaved mango trees be happy and carefree in a patch of low grass? Reflect on these matters. It is most desirable that you stay at home." Sita listened to these words of Rama, spoken so soft and sweet; but, all the while, she stood with her eyes on the ground, and tears were streaming down her cheeks. She stood like a pillar, unmoved and immovable. Her tears fell continuously on the floor; Rama could not bear the sight of her distress. Sita could find no word to answer the objections Rama raised. Finally, she managed to control her emotions, and swallow her grief. She said, "O Lord of my life! You are the treasure-house of everything good and auspicious. When I am separated from you, even heaven is horrible hell. Parents, brothers, sisters, parents-in-law, sons, preceptors, kinsmen - all these might be resplendent repositories of goodness; but, for a woman, her husband is the only source of strength, joy and fortune. He alone can grant her happiness and delight. Except the husband, she has none to guide her and guard her; he is her refuge, her only resort. Lord! When the husband is away from her, the wife will find the body, the home, the city, the kingdom, the wealth heaped around her, everything as sources of grief and sorrow. They cannot confer joy on her stricken mind. Sweetness will turn bitter when her Lord is away. Delight will be curdled into disease. All the joys I crave for are centered in you. Nothing can equal the ecstasy I derive when I fix my eyes on your face that shines so bright and comforting like the full moon in autumn. When I am with you there the birds and beasts will be my kith and kin. The forest will be the city I love. The apparel made of tree bark will be silken clothes. The hermitage with the thatch of leaves will be as delightful a home for me as a heavenly mansion. The fairies and angels of the forest, the sylvan deities will be parents-in-law. I shall revere them with equal awe. When I am with you, sheaves of grass and heaps of floral petals will give as much softness for the bed. The God of Love cannot aspire for more. And, the tubers, roots and fruits that you speak of will be as sweet and sustaining as Divine Nectar itself! The mountain peaks there will gladden me as much as the towers of Ayodhya. I will come down one slope and climb another, as gladly as while coming down one flight of stairs and getting up another here. It will be so easy and delightful. 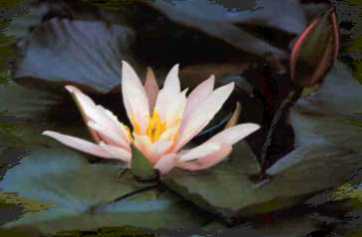 "Every day, I will derive the thrill of delight at the sight of your Lotus Feet. Besides, this will be a golden chance for me to serve you at all times in every way. How can I survive the agony, if I am to lose this precious chance? 0, Treasure-chest of Mercy! Do not leave me here; take me with you! Really there is no need for me to pour these importunities into your ear; for, you reside in all beings and you are aware of all that they feel and think. It isn't proper that you should inflict such pain on me, when you know how my heart is yearning for the chance to be with you. Lord! I am downcast, miserable. If you leave me and go, it will bring your name down. You have all the noble attributes; why then deny mercy to me? Can I keep alive for fourteen years, separated from you? I find it impossible to keep alive even for ten winks of separation! Accept my prayer, show me a little kindness. When I am with you, how can any one dare harm or attack me? Why? No one dare cast a glance at me. Can the jackal or the hare open its eye and dare look at the lion? I am not a tender fragile person. To speak the truth, you are tenderness personified! The Earth is my mother. Therefore, I have every right and every strength to traverse the Earth. Really, happiness is your share in life; my lot is to sufier. When such is the case, why do you invert facts and cause disappointment to me. It is not correct. I declare that I can carry out with ease tasks which are beyond you! You know full well that I lifted up and placed aside the Bow of Siva, that no king however proud of his prowess could lift. I am surprised that you doubt my capabilities! My valour and skill are not inferior to yours. So, do give me permission and make arrangements to depart with me in great joy." Sita bowed low, and fell at Rama's feet with these words. Rama felt that it would be improper to continue resisting her wishes. He resolved to yield. "Sita!" he said, "Give up your grief. Do not give way to sadness. As you desire, I shall take you with me. Engage yourselves quickly in preparing for the journey to the forest!" Hearing the sweet words with which Ramachandra spoke, Sita was elated; she was filled with boundless joy. She said, "Preparation? What has one to prepare, to live in the forest? I am always ready, with whatever I need, for I need only you; I have no other want. I am following you, this moment. In you I have all I need. You know I have no desire for anything other than you". With these words, she held Ramaís hand in hers and stepped forward. 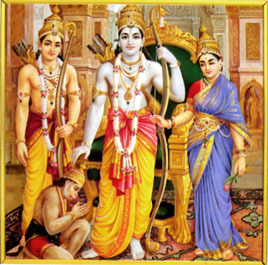 Rama said, "Sita! Consider this: You will not be in Ayodhya for fourteen years. Therefore, go and release the parrots and birds you have reared as pets with love and care. And the cows you fostered with affection! Give them away to Brahmins, so that they might be treated lovingly. Distribute the various articles of dress, the vehicles, and other articles used by you, to the people, or else, they will be ruined by time. It is far better that they be used rather than get disintegrated". When this suggestion was made, Sita immediately ran towards the cages, and addressing each pet bird in loving accents, told them; "Go! Like us, roam freely in the beautiful forest." With her own hands, she opened the cages and set them free! Then she went to the cow-shed. She fed the cows with various tasty foods and talked to the Brahmins who were to receive them as gifts. Her charming face beamed with joy. Spectators who watched her giving the things away felt their hearts melt with sorrow at her impending departure. They shed tears in streams for they were moved by the large-hearted generosity, and more than all, by her exultation at the prospect of accompanying her husband into exile in the forest. Her ecstasy was beyond the pen of any poet. Meanwhile, Lakshmana joined them. After taking leave of his mother the three then moved on.